Migration generates complex social realities in which a variety of moral requirements come into play. Traditional moral theories, with their methodological nationalism, are insufficient to adequately attend to such complexity. 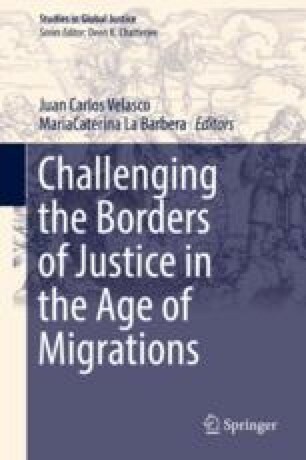 A theory of global justice is required, and cosmopolitanism is proposed as an adequate basis for evaluating migration policies. Critical cosmopolitanism complements the arguments of freedom of movement and equality of opportunities based on the individualist, rationalist and universalist premises of classical cosmopolitanism, with arguments in favor of responsibility in political structures and immigrants’ recognition and participation in political communities. This revised cosmopolitanism assumes the relevance of a plurality of moral commitments and reinterprets universalism in a procedural, contextual and open sense. From this perspective, an illative logic of “both/and” allows for a reconsideration of crucial political concepts. This chapter proposes, firstly, a reframed concept of state legitimacy according to which the local, the national and the global cease to be considered mutually exclusive realms; secondly, a reformulation of the nexus between citizenship and the State and the necessity to reshape spaces for solidarity and participation; and, finally, a foundation of public culture on the recognition of others in their otherness through dialogue.